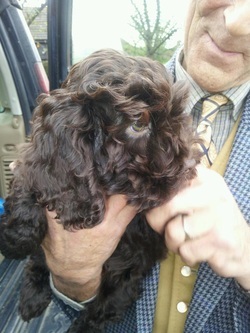 Well - I guess Captain Blue needs a faithful companion, so - welcome to the madness, Coco,the Cockapoo! Well - I have done it now - CD Production Master and finalised cd and cd booklet artwork all delivered to St Albans! So, today is in many ways the penultimate culmination of...well everything really. The culmination will be when they are delivered! How jolly exciting - a brilliant week with Touchstone and The Reasoning; solo album has gone off for production and it is a Friday and beer o'clock! Marvellous!! Next stop - cd booklet and promo. And Mr Hodgie is up o his neck in day job stuff, so we will have to be patient.